Traditionally made with ground sesame seed, this okra side gets its authentic flavour from the KRAFT Asian Sesame Dressing. Heat oil in large skillet on medium-high heat. Add next 3 ingredients; cook and stir 2 min. or until onions are crisp-tender. Add all remaining ingredients except lemon juice; stir. Cover; simmer on medium-low heat 15 to 20 min. or just until okra is tender, stirring occasionally. Uncover skillet; cook on medium heat 7 to 10 min. or until okra is dry. Remove from heat; stir in lemon juice. 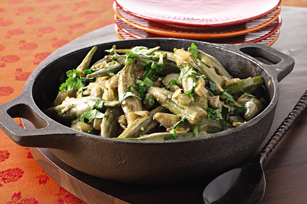 The okra in this tasty dish provides an excellent source of vitamin C.